Chief among the elisions is the attempt to spin the collapse in hard-copy sales as some kind of “bold transition”, rather than a shift foisted on the company by a collapsing market. The closeness of Evgeny Lebedev, son of Alexander, to Tory politicians like Boris Johnson famously compromised the paper on the eve of the last general election, leading the Indy to back a Tory-Lib Dem coalition despite the fact far more of its readers (and many of its journalists) backed Labour. It is true that the Indy did usher in some bold changes to British journalism, its greatest success being the i, whose sales figures are cynically included in Lebedev’s own summary of the Indy’s growth since he took over the paper, despite many crediting the cheap-sheet with undermining the main title whilst relying on its resources. The i is being sold off to Johnston press for some £24m. Some 100 staff are also due to be laid off as the Indy shifts its efforts to the digital sphere, according to a report from No. 1412 of Private Eye. A number of staffers have even been going freelance over the past couple weeks, either unconvinced of their chances of a job under the reorganisation or unwilling to write for the more clickbait-oriented online offerings. All of this is perhaps harsh. The media business has rarely been a profitable one, and the last decade has been particularly hard as tech companies gorge themselves on the advertising revenues that kept many papers aloft in times gone by. The Indy, despite its stated neutrality, has long swung more leftwards than right, and for some reason lefties buy papers in fewer numbers than their political opponents. 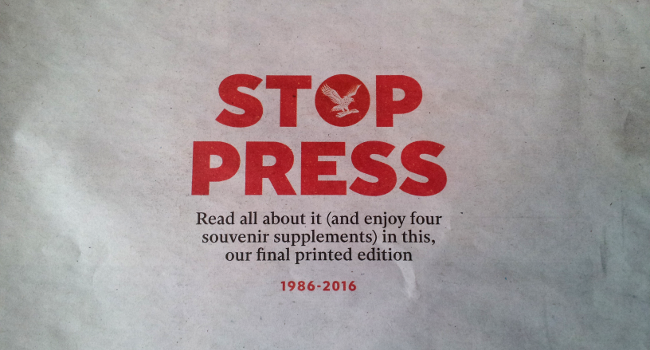 Even so, the paper has its share of great pieces, and will no doubt continue to produce them. In the last edition of the Indy Howard Jacobson, a columnist of 18 years, penned perhaps the greatest sign-off in the history of the medium. In news, the good must be taken with the bad.